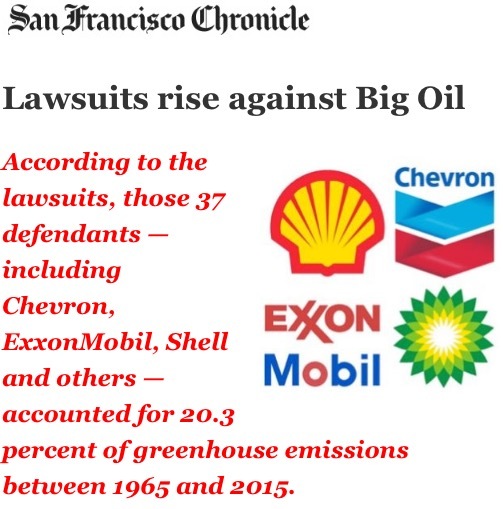 Oil companies want SF, Oakland climate lawsuits dismissed Excerpts with my bolds. This site has several posts describing how the electrical system has been mangled by green ideologues, and they have no one but themselves to blame. The article is written by a hand-wringing climatist, upset that the social proofs are failing at voters’ wallets. One of the signature policies of the incumbent Liberal Party is leadership on climate change. And, since most of us care about helping the world’s climate, this should be a winning issue for the Liberals. Not in Ontario though. At least not now. That’s because the effects of the Liberal’s approach to dealing with carbon, including changes to hydro rates and carbon pricing, has helped to galvanize a potential winning coalition around Doug Ford and the PC Party. For many voters this no longer about helping the climate, it’s about increasing taxes, affordability, and government mismanagement. What’s also happened in this election is that the emphasis in the phrase “carbon tax” has moved from the “carbon” to the “tax.” And, since voters are more concerned about taxes than climate today, the cure for too many seems worse than the disease. This is especially the case for voters who are more pessimistic about the economy. Evidence of how public views have aligned against the Liberal’s management of the climate issue emerges when you ask Ontarians if the carbon tax is just a tax grab: 72 per cent agree. This includes 85 per cent of PC voters, 72 per cent of NDP voters, and even 54 per cent of Liberal voters. Another 68 percent of Ontario voters also agree that a carbon tax is nothing but a pointless gesture that won’t help the earth’s climate. When you add it up then, carbon pricing has become a political millstone around the neck of the Ontario Liberal Party in this election. This won’t end with the Ontario election. That’s because the Trudeau Liberals, like the Wynne Liberals, have made carbon pricing a cornerstone issue for their mandate. Based on what we’re now seeing, this issue could also represent an electoral liability for the federal Liberals in Ontario. And, the situation won’t be helped by a Premier Doug Ford who has vowed to fight the pending federal climate tax if he is elected on June 7. Are people finally seeing the light? Chicxulub asteroid Apocalypse? Not so fast. Chicxulub asteroid triggered a global temperature rise of 5°C (9°F). This notion has been around for years, but dredged up now to promote fears of CO2 and global warming. And maybe it’s because of a new Jurassic Park movie coming this summer. But it doesn’t take much looking around to discover experts who have a sober, reasonable view of the situation. Princeton expert Gerta Keller, Professor of Geosciences at Princeton, has studied this issue since the 1990s and tells all at her website CHICXULUB: THE IMPACT CONTROVERSY Excerpts below with my bolds. In the 1980s as the impact-kill hypothesis of Alvarez and others gained popular and scientific acclaim and the mass extinction controversy took an increasingly rancorous turn in scientific and personal attacks fewer and fewer dared to voice critique. Two scientists stand out: Dewey McLean (VPI) and Chuck Officer (Dartmouth University). Dewey proposed as early as 1978 that Deccan volcanism was the likely cause for the KTB mass extinction, Officer also proposed a likely volcanic cause. Both were vilified and ostracized by the increasingly vocal group of impact hypothesis supporters. By the middle of the 1980s Vincent Courtillot (Physique de Globe du Paris) also advocated Deccan volcanism, though not as primary cause but rather as supplementary to the meteorite impact. 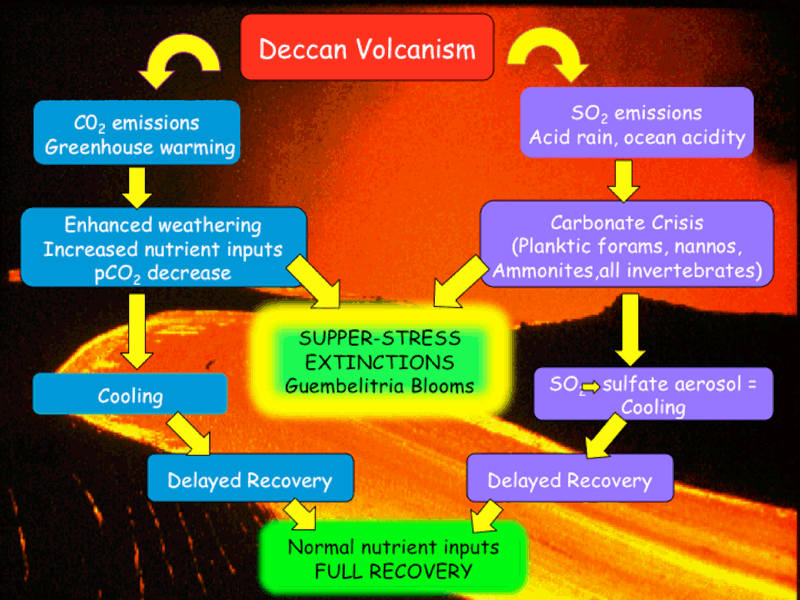 Since 2008 Courtillot has strongly advocated Deccan volcanism as the primary cause for the KTB mass extinction. (Overview from Tim Clarely, Ph.D. questioning the asteroid) In secular literature and movies, the most popular explanation for the dinosaurs’ extinction is an asteroid impact. The Chicxulub crater in Mexico is often referred to as the “smoking gun” for this idea. But do the data support an asteroid impact at Chicxulub? The Chicxulub crater isn’t visible on the surface because it is covered by younger, relatively undeformed sediments. 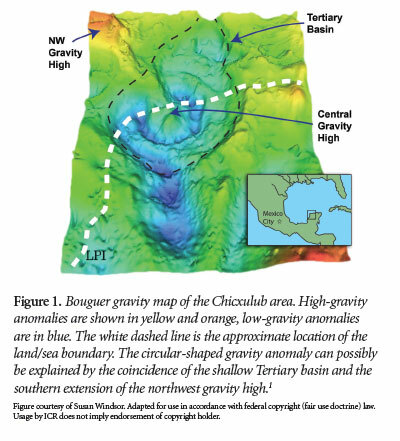 It was identified from a nearly circular gravity anomaly along the northwestern edge of the Yucatán Peninsula (Figure 1). There’s disagreement on the crater’s exact size, but its diameter is approximately 110 miles—large enough for a six-mile-wide asteroid or meteorite to have caused it. Although some of the expected criteria for identifying a meteorite impact are present at the Chicxulub site—such as high-pressure and deformed minerals—not enough of these materials have been found to justify a large impact. And even these minerals can be caused by other circumstances, including rapid crystallization4 and volcanic activity. The biggest problem is what is missing. Iridium, a chemical element more abundant in meteorites than on Earth, is a primary marker of an impact event. A few traces were identified in the cores of two drilled wells, but no significant amounts have been found in any of the ejecta material across the Chicxulub site. The presence of an iridium-rich layer is often used to identify the K-Pg (Cretaceous-Paleogene) boundary, yet ironically there is virtually no iridium in the ejecta material at the very site claimed to be the “smoking gun”! In addition, secular models suggest melt-rich layers resulting from the impact should have exceeded a mile or two in thickness beneath the central portion of the Chicxulub crater. However, the oil wells and cores drilled at the site don’t support this. The thickest melt-rich layers encountered in the wells were between 330 and 990 feet—nowhere near the expected thicknesses of 5,000 to 10,000 feet—and several of the melt-rich layers were much thinner than 300 feet or were nonexistent. The Cretaceous-Tertiary boundary (KTB) mass extinction is primarily known for the demise of the dinosaurs, the Chicxulub impact, and the frequently rancorous thirty years-old controversy over the cause of this mass extinction. Since 1980 the impact hypothesis has steadily gained support, which culminated in 1990 with the discovery of the Chicxulub crater on Yucatan as the KTB impact site and “smoking gun” that proved this hypothesis. In a perverse twist of fate, this discovery also began the decline of this hypothesis, because for the first time it could be tested directly based on the impact crater and impact ejecta in sediments throughout the Caribbean, Central America and North America. Two decades of multidisciplinary studies amassed a database with a sum total that overwhelmingly reveals the Chicxulub impact predates the KTB mass extinction. It’s been a wild and frequently acrimonious ride through the landscape of science and personalities. The highlights of this controversy, the discovery of facts inconsistent with the impact hypothesis, the denial of evidence, misconceptions, and misinterpretations are recounted here. (Full paper in Keller, 2011, SEPM 100, 2011). Figure 42. 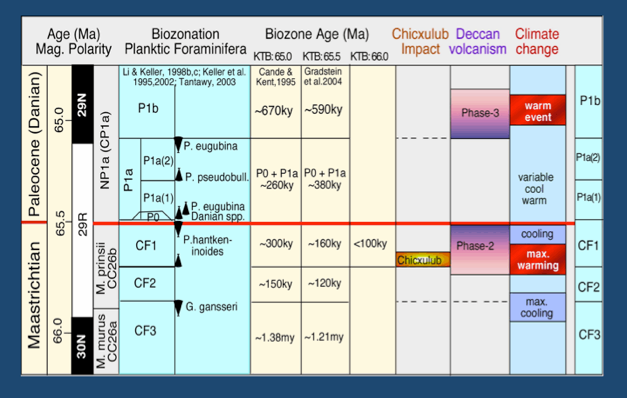 Planktic foraminiferal biostratigraphy, biozone ages calculated based on time scales where the KTB is placed at 65Ma, 65.5Ma and 66Ma, and the relative age positions of the Chicxulub impact, Deccan volcanism phases 2 and 3 and climate change, including the maximum cooling and maximum warming (greenhouse warming) and the Dan-2 warm event relative to Deccan volcanism. Most studies surrounding the Chicxulub impact crater have concentrated on the narrow interval of the sandstone complex or so-called impact-tsunami. Keller et al. (2002, 2003) placed that interval in zone CF1 based on planktic foraminiferal biostratigraphy and specifically the range of the index species Plummerita hantkeninoides that spans the topmost Maastrichtian. Zone CF1. The age of CF1 was estimated to span the last 300ky of the Maastrichtian based on the old time scale of Cande and Kent (1995) that places the KTB at 65Ma. The newer time scale (Gradstein et al., 2004) places the KTB at 65.5Ma, which reduces zone CF1 to 160ky. By early 2000 our team embarked on an intensive search for impact spherules below the sandstone complex throughout NE Mexico. Numerous outcrops were discovered with impact spherule layers in planktic foraminiferal zone CF1 below the sandstone complex and we suggested that the Chicxulub impact predates the KTB by about 300ky (Fig. 42; Keller et al., 2002, 2003, 2004, 2005, 2007, 2009; Schulte et al., 2003, 2006). Time scales change with improved dating techniques. Gradstein et al (2004) proposed to place the KTB at 65.5 Ma, (Abramovich et al., 2010). This time scale is now undergoing further revision (Renne et al., 2013) placing the KTB at 66 Ma, which reduces zone CF to less than 100ky. By this time scale, the age of the Chicxulub impact predates the KTB by less than 100ky based on impact spherule layers in the lower part zone CF1. See Fig. 42 for illustration. Unfortunately, this wide interest rarely resulted in integrated interdisciplinary studies or joint discussions to search for common solutions to conflicting results. Increasingly, in a perverse twist of science new results became to be judged by how well they supported the impact hypothesis, rather than how well they tested it. An unhealthy US versus THEM culture developed where those who dared to question the impact hypothesis, regardless of the solidity of the empirical data, were derided, dismissed as poor scientists, blocked from publication and getting grant funding, or simply ignored. Under this assault, more and more scientists dropped out leaving a nearly unopposed ruling majority claiming victory for the impact hypothesis. In this adverse high-stress environment just a small group of scientists doggedly pursued evidence to test the impact hypothesis. 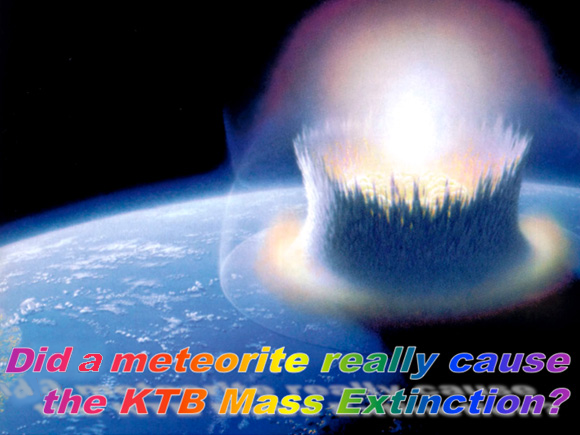 No debate has been more contentious during the past thirty years, or has more captured the imagination of scientists and public alike, than the hypothesis that an extraterrestrial bolide impact was the sole cause for the KTB mass extinction (Alvarez et al., l980). How did this hypothesis evolve so quickly into a virtually unassailable “truth” where questioning could be dismissed by phrases such as “everybody knows that an impact caused the mass extinction”, “only old fashioned Darwinian paleontologists can’t accept that the mass extinction was instantaneous”, “paleontologists are just bad scientists, more like stamp collectors”, and “it must be true because how could so many scientists be so wrong for so long.” Such phrases are reminiscent of the beliefs that the Earth is flat, that the world was created 6000 years ago, that Noah’s flood explains all geological features, and the vilification of Alfred Wegner for proposing that continents moved over time. What killed the dinosaurs? Few questions in science have been more mysterious—and more contentious. Today, most textbooks and teachers tell us that nonavian dinosaurs, along with three-fourths of all species on Earth, disappeared when a massive asteroid hit the planet near the Yucatán Peninsula some 66 million years ago. But a new study published in the journal Geology shows that an episode of intense volcanism in present-day India wiped out several species before that impact occurred. The result adds to arguments that eruptions plus the asteroid caused a one-two punch. The volcanism provided the first strike, weakening the climate so much that a meteor—the more deafening blow—was able to spell disaster for Tyrannosaurs rex and its late Cretaceous kin. A hotter climate certainly helped send the nonavian dinosaurs to their early grave, says Paul Renne, a geochronologist at the University of California, Berkeley, who was not involved in the study. That’s because the uptick in temperature was immediately followed by a cold snap—a drastic change that likely set the stage for planet-wide disaster. Imagine that some life managed to adapt to those warmer conditions by moving closer toward the poles, Renne says. “If you follow that with a major cooling event, it’s more difficult to adapt, especially if it’s really rapid,” he says. In this scenario, volcanism likely sent the world into chaos, driving many extinctions alone and increasing temperatures so drastically that most of Earth’s remaining species couldn’t protect themselves from that second punch when the asteroid hit. “The dinosaurs were extremely unlucky,” Wignall says. But it will be hard to convince Sean Gulick, a geophysicist at the University of Texas at Austin, who co-led recent efforts to drill into the heart of the impact crater in Mexico. He points toward several studies that have suggested that ecosystems remained largely intact until the time of the impact. Additionally, a forthcoming paper might make an even stronger case that the impact drove the extinction alone, notes Jay Melosh, a geophysicist at Purdue University who has worked on early results from the drilling project. It looks as though the divisive debate will continue with nearly as much ferocity as the events that rocked our world 66 million years ago. So if the Chicxulub asteroid didn’t kill the dinosaurs, what did? Paleontologists have advanced all manner of other theories over the years, including the appearance of land bridges that allowed different species to migrate to different continents, bringing with them diseases to which native species hadn’t developed immunity. Keller and Addate do not see any reason to stray so far from the prevailing model. Some kind of atmospheric haze might indeed have blocked the sun, making the planet too cold for the dinosaurs — it just didn’t have to have come from an asteroid. Rather, they say, the source might have been massive volcanoes, like the ones that blew in the Deccan Traps in what is now India at just the right point in history. For the dinosaurs that perished 65 million years ago, extinction was extinction and the precise cause was immaterial. But for the bipedal mammals who were allowed to rise once the big lizards were finally gone, it is a matter of enduring fascination. This science seems as settled as climate change/global warming, and with many of the same shenanigans. New Zealand Cook National Park. 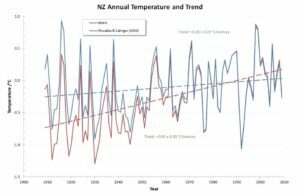 A dust up over the temperature trend in New Zealand is discussed at the the climate conversation New Zealand Response to NIWA comment on de Freitas reanalysis of the NZ temperature record by Barry Brill, Chairman of the New Zealand Climate Science Coalition. Excerpts with my bolds. de Freitas finds that New Zealand has experienced an insignificant warming trend of 0.28°C/century during 1909-2008. Using the same data, the Mullan Report calculates that trend at 0.91°C/century. Both studies claim to apply the statistical technique described in RS93, and each alleges that the other has departed from that methodology. This core issue has been described in the graph above but has not been addressed in this note. Good to see that de Fritas et al are again speaking climate truth to entrenched alarmists. Go Kiwis! Full story is Inquiry not Dogma, which includes links and background information. Excerpts with my bolds. Poels challenged the audience with evidence that food security is at risk due to ‘green’ energy policies while Dr. Khandekar deconstructed climate alarmism with convincing evidence that extreme weather is mostly media hype. Left-wing, progressive Poels recounted to the Friends of Science event audience how he had worked in conflict and poverty countries for nine years, making 50 films in that time. When he returned home to Europe for some recovery time in the pastoral countryside, he was surprised, then alarmed to find that EU climate and energy policies were trading food security for unreliable, expensive ‘energy’ security. Curious to find the root of this strange set of policies, Poels followed the money and policy to talk with climate scientists and agricultural experts. Poels noted that he had a broad-reaching, very supportive media network for his human rights and justice films; this dried up the moment he broached the topic of climate change.His 2017 documentary film exposed how climate change policies are threatening modern civilization. Trailer can be viewed below. 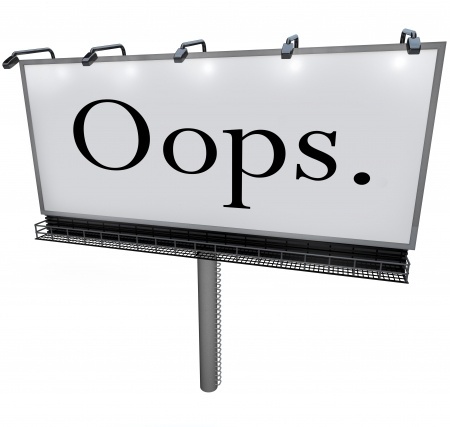 My recent post on this subject was Climate Policies Failure, the Movie. Dr. Madhav Khandekar, former Environment Canada researcher, gave a lively, humorous presentation that debunked the claims of extreme weather being more frequent or caused by human influence on climate or human industrial carbon dioxide emissions. Khandekar explained some of the intricacies of the global effects of the natural, cyclical El Nino Southern Oscillation and its mirror image, La Nina. Overall, Khandekar says the only noticeable trends are toward longer cold snaps, a possible harbinger of long periods of cold and erratic weather as experienced in the Little Ice Age, during a solar minimum. Khandekar was an instructor at the University of Alberta early on in his career, an institution now embroiled in a vigorous public debate about the propriety of conferring an honorary degree on Dr. David Suzuki at this spring’s convocation. Shell investors revolt over pay and maintain pressure over climate change; Oil firm grilled over carbon emissions, but defeats motion calling for tougher targets. The resolution (“2DS”) represents a new front in attempts to constrain oil majors since it seeks authority to set operational goals in reference to the Paris accord, normally the discretion of management. BTW this type of resolution requires 75% approval, and only got 6%. Proxy advisors exercise great influence in these fights and are coming under increasing scrutiny and criticism for promoting causes against the financial interests of shareholders. In this case some may be taking notice that virtue signaling is not free of consequences. Independent European proxy advisory group ECGS recommended investors back the climate resolution, but major advisers Glass Lewis and ISS opposed it. The results show no major institutional investor (including Norwegian wealth fund) gave support. The background and context for shareholder climate activism comes from Harvard Law School forum on Corporate Governance 2018 Proxy Season Preview Excerpts with my bolds. 2017 was breakout year for climate change campaigns with three landmark majority votes asking Exxon Mobil, Occidental Petroleum, and PPL to report on how they plan to adjust their business models in line with the Paris Accord’s goal of limiting global warming to 2° Celsius (“2° scenario” or “2DS”). The results reflect a sea change in the attitude and voting practices of several major asset managers—BlackRock, Vanguard Group and Fidelity Management & Research—which for the first time supported some of the climate change resolutions last year. Of the three, Fidelity made the greatest shift in its voting, backing every one of the 2DS resolutions it voted on, while BlackRock and Vanguard only endorsed the two at Exxon and Occidental. Other institutional investors could follow suit, particularly as a result of pressure from their own shareholders and clients. Last year, Walden Asset Management withdrew proposals at BlackRock, Vanguard, and JPMorgan Chase after the firms agreed to review inconsistencies between their proxy voting records and their public stance on climate change. Walden and other filers have similar resolutions pending this year at Bank of New York Mellon and Cohen & Steers and withdrew a third at T. Rowe Price Group. Franklin Resources, which has received proxy voting review resolutions every year since 2014, wasn’t retargeted in 2018 because it improved its approach by voting for 24% of climate risk proposals in 2017, compared to 10% in 2016. The proxy advisors have also amended their voting policies for 2018 to reflect their general support of resolutions to disclose climate-related risks. ISS’s policy now extends to proposals on how the company identifies, measures and manages such risks, in keeping with the recommendations of the TFCD, while Glass Lewis will largely back requests for climate change scenario analyses at companies in extractive or energy-intensive industries. All of this has galvanized shareholder activists, who have filed a new round of 2DS proposals for 2018 with the expectation of generating a higher number of favorable votes or encouraging pro-action by companies. In addition to last year’s three majority vote companies, Duke Energy and Marathon Petroleum have produced or committed to producing climate impact reports, even though 2017 proposals received less than majority support. Several utilities targeted in 2018—CMS Energy, DTE Energy and WEC Energy Group—have also agreed to publish climate assessments. Even so, not all company responses have satisfied investors. Exxon’s newly released report has already drawn criticism from proponents for concluding that aggressive climate policies pose little risk to its reserves because the demand for fossil fuels will remain strong for decades. Individual investor Steven Milloy went a step further by characterizing these reporting exercises as mere “greenwashing” to improve companies’ public image. In a proposal at Exxon that was later withdrawn, he asserted that many voluntary activities and expenditures touted as protecting the climate are a waste of corporate assets that fail to yield any meaningful benefits to shareholders, public health, or the environment. As a case in point, two years after BP and Royal Dutch Shell shareholders overwhelmingly passed 2DS resolutions, the companies still disclose only minimal information on how they are mitigating climate risks, and they have yet to set greenhouse gas (GHG) reduction targets or markedly improved their investments in low-carbon technology. Although 2DS will be the most-watched environmental category this year, other climate-related resolutions could generate significant support. As You Sow and Miller/Howard Investments have filed resolutions at nine oil and gas producers to report on their efforts to monitor and minimize methane leakage. Prior support on these proposals has been strong, averaging 31.7% in 2017, including two resolutions that received votes in the 40% range. Aside from energy firms, proponents are targeting a broad range of industries with resolutions to set goals to reduce GHG emissions or increase renewable energy sourcing. In the past, these measures have averaged support in the 20% range, though several this year have already yielded commitments from AES, American Electric Power, and Western Union. A proposal variation favored by Jantz Management and Amalgamated Bank—to assess the feasibility of achieving net-zero GHG emissions by a specific date—continues to be excludable as ordinary business. This trend, while relatively new, is alarming and it differs significantly from traditional activism. While traditional activist shareholders used the proxy proposal process to advance views that differed from management on what was best for the company, they never did anything that would undermine the reason for their investment, which was to maximize shareholder value. In contrast, the new wave of shareholder activists, have a fundamentally different goal; to exploit the proxy proposal process to drive wider societal change. Shell Resolution: Shareholders support Shell to take leadership in the energy transition to a net-zero-emission energy system. Therefore, shareholders request Shell to set and publish targets for reducing greenhouse gas (GHG) emissions that are aligned with the goal of the Paris Climate Agreement to limit global warming to well below 2°C. This shareholder resolution is intended to express shareholder support for a course towards a net-zero-emission energy system. The why of a course towards a net-zero-emission energy system is clear: increasing costs of the extraction of fossil fuels, decreasing costs of generating renewable energy, and the global political pledge to stop global warming. The how and the what are up to the management of Shell. It is up to them to set GHG emission reduction targets and to develop activities to attain these targets. RESOLVED: Shareholders request that, beginning in 2018, ExxonMobil publish an annual assessment of the long-term portfolio impacts of technological advances and global climate change policies, at reasonable cost and omitting proprietary information. The assessment can be incorporated into existing reporting and should analyze the impacts on ExxonMobil’s oil and gas reserves and resources under a scenario in which reduction in demand results from carbon restrictions and related rules or commitments adopted by governments consistent with the globally agreed upon 2 degree target. This reporting should assess the resilience of the company’s full portfolio of reserves and resources through 2040 and beyond, and address the financial risks associated with such a scenario. Hidden amid reports of recent warmest months and years based on global averages, there is a significant departure in North America. Those of us living in Canada and USA have noticed a distinct cooling, and our impressions are not wrong. The image above shows how much lower have been April 2018 temperatures. The table below provides the numbers behind the graphs from NOAA State of the Climate. The table shows how different was the North American experience: 94th out of 109 years. But when we look at the first four months of the year, the NA is more in line with the rest of the globe. As the image shows, cooling was more widespread during the first third of 2018, particularly in NA, Northern Europe and Asia, as well as a swath of cooler mid ocean latitudes in the Southern Hemisphere. The table confirms that Europe and Asia are cooler in 2018 than recent years in the decade. These data show again that temperature indicators of climate are not global but regional, and even local in their manifestations. At the continental level there are significant differences. North America is an outlier, but who is to say whether it is an aberration that will join the rest, or whether it is the trend setter signaling a widespread cooler future. See Also: Is This Cold the New Normal? In May, Arctic ice extent declined as usual with the notable exception of Bering Sea, now almost ice free. Bering still has some ice to lose, but at 23k km2 it is only 5% of the ice there March 17 at annual Bering maximum, just two months ago. It is unusual since the Bering ice is only 10% of the 11 year average for this date. Nearby Chukchi Sea is showing open water, somewhat ahead of schedule. Okhotsk also in the Pacific is melting and now below average for this date. Elsewhere things are mostly typical. 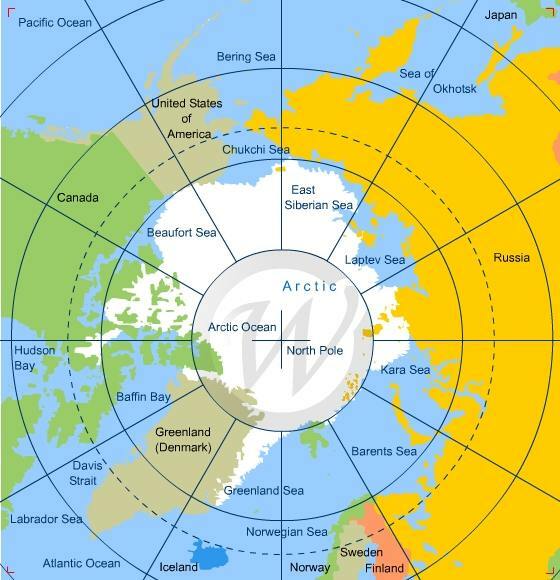 Russian and Canadian basins are frozen with high extents and Barents is now matching average. The graph below shows how the Arctic extent has faired in May compared to the 11 year average with and without the Pacific basins of Bering and Okhotsk. 2018 (brown line lacks B&O) is tracking the orange line with some divergence lately. The graph below shows May 2018 compared to average and some years of interest. Note that 2017 tracks above the 11-year average. 2018 is tracking 2007, which will match average by end of May. The table below shows ice extents by regions comparing 2018 with 11-year average (2007 to 2017 inclusive) and 2007. As indicated Bering supplies almost half of the deficit to average, along with Chukchi and Okhotsk deficits. Lack of ice in Greenland Sea may signify a reduced flow of drift ice out of the Arctic through Fram Strait. Current ice chart from AARI St. Petersburg Russia. Old sea ice is in brown. With the Democrats taking control of the US House of Representatives, we can expect attempts to again “fight climate change” by means of counter productive regulations. This post explains why such policies are ineffective and produce unintended consequences, with results worse than doing nothing. In the sub-atomic domain of quantum mechanics, Werner Heisenberg, a German physicist, determined that our observations have an effect on the behavior of quanta (quantum particles). The Heisenberg uncertainty principle states that it is impossible to know simultaneously the exact position and momentum of a particle. That is, the more exactly the position is determined, the less known the momentum, and vice versa. This principle is not a statement about the limits of technology, but a fundamental limit on what can be known about a particle at any given moment. This uncertainty arises because the act of measuring affects the object being measured. The only way to measure the position of something is using light, but, on the sub-atomic scale, the interaction of the light with the object inevitably changes the object’s position and its direction of travel. Now skip to the world of governance and the effects of regulation. A similar finding shows that the act of regulating produces reactive behavior and unintended consequences contrary to the desired outcomes. An article at Financial Times explains about Energy Regulations Unintended Consequences Excerpts below with my bolds. Goodhart’s Law holds that “any observed statistical regularity will tend to collapse once pressure is placed upon it for control purposes”. Originally coined by the economist Charles Goodhart as a critique of the use of money supply measures to guide monetary policy, it has been adopted as a useful concept in many other fields. The general principle is that when any measure is used as a target for policy, it becomes unreliable. It is an observable phenomenon in healthcare, in financial regulation and, it seems, in energy efficiency standards. When governments set efficiency regulations such as the US Corporate Average Fuel Economy standards for vehicles, they are often what is called “attribute-based”, meaning that the rules take other characteristics into consideration when determining compliance. The Cafe standards, for example, vary according to the “footprint” of the vehicle: the area enclosed by its wheels. In Japan, fuel economy standards are weight-based. Like all regulations, fuel economy standards create incentives to game the system, and where attributes are important, that can mean finding ways to exploit the variations in requirements. There have long been suspicions that the footprint-based Cafe standards would encourage manufacturers to make larger cars for the US market, but a paper this week from Koichiro Ito of the University of Chicago and James Sallee of the University of California Berkeley provided the strongest evidence yet that those fears are likely to be justified. Mr Ito and Mr Sallee looked at Japan’s experience with weight-based fuel economy standards, which changed in 2009, and concluded that “the Japanese car market has experienced a notable increase in weight in response to attribute-based regulation”. In the US, the Cafe standards create a similar pressure, but expressed in terms of size rather than weight. Mr Ito suggested that in Ford’s decision to end almost all car production in North America to focus on SUVs and trucks, “policy plays a substantial role”. It is not just that manufacturers are focusing on larger models; specific models are also getting bigger. Ford’s move, Mr Ito wrote, should be seen as an “alarm bell” warning of the flaws in the Cafe system. He suggests an alternative framework with a uniform standard and tradeable credits, as a more effective and lower-cost option. With the Trump administration now reviewing fuel economy and emissions standards, and facing challenges from California and many other states, the vehicle manufacturers appear to be in a state of confusion. An elegant idea for preserving plans for improving fuel economy while reducing the cost of compliance could be very welcome. An attribute-based regulation is a regulation that aims to change one characteristic of a product related to the externality (the “targeted characteristic”), but which takes some other characteristic (the “secondary attribute”) into consideration when determining compliance. For example, Corporate Average Fuel Economy (CAFE) standards in the United States recently adopted attribute-basing. Figure 1 shows that the new policy mandates a fuel-economy target that is a downward-sloping function of vehicle “footprint”—the square area trapped by a rectangle drawn to connect the vehicle’s tires. Under this schedule, firms that make larger vehicles are allowed to have lower fuel economy. This has the potential benefit of harmonizing marginal costs of regulatory compliance across firms, but it also creates a distortionary incentive for automakers to manipulate vehicle footprint. Attribute-basing is used in a variety of important economic policies. Fuel-economy regulations are attribute-based in China, Europe, Japan and the United States, which are the world’s four largest car markets. Energy efficiency standards for appliances, which allow larger products to consume more energy, are attribute-based all over the world. Regulations such as the Clean Air Act, the Family Medical Leave Act, and the Affordable Care Act are attribute-based because they exempt some firms based on size. In all of these examples, attribute-basing is designed to provide a weaker regulation for products or firms that will find compliance more difficult. Summary from Heritage Foundation study Fuel Economy Standards Are a Costly Mistake Excerpt with my bolds. The CAFE standards are not only an extremely inefficient way to reduce carbon dioxide emission but will also have a variety of unintended consequences. For example, the post-2010 standards apply lower mileage requirements to vehicles with larger footprints. Thus, Whitefoot and Skerlos argued that there is an incentive to increase the size of vehicles. Data from the first few years under the new standard confirm that the average footprint, weight, and horsepower of cars and trucks have indeed all increased since 2008, even as carbon emissions fell, reflecting the distorted incentives. Manufacturers have found work-arounds to thwart the intent of the regulations. For example, the standards raised the price of large cars, such as station wagons, relative to light trucks. As a result, automakers created a new type of light truck—the sport utility vehicle (SUV)—which was covered by the lower standard and had low gas mileage but met consumers’ needs. Other automakers have simply chosen to miss the thresholds and pay fines on a sliding scale. 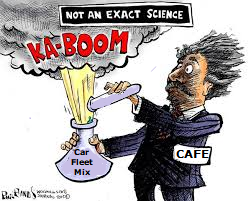 Another well-known flaw in CAFE standards is the “rebound effect.” When consumers are forced to buy more fuel-efficient vehicles, the cost per mile falls (since their cars use less gas) and they drive more. This offsets part of the fuel economy gain and adds congestion and road repair costs. Similarly, the rising price of new vehicles causes consumers to delay upgrades, leaving older vehicles on the road longer. In addition, the higher purchase price of cars under a stricter CAFE standard is likely to force millions of households out of the new-car market altogether. Many households face credit constraints when borrowing money to purchase a car. David Wagner, Paulina Nusinovich, and Esteban Plaza-Jennings used Bureau of Labor Statistics data and typical finance industry debt-service-to-income ratios and estimated that 3.1 million to 14.9 million households would not have enough credit to purchase a new car under the 2025 CAFE standards. This impact would fall disproportionately on poorer households and force the use of older cars with higher maintenance costs and with fuel economy that is generally lower than that of new cars. CAFE standards may also have redistributed corporate profits to foreign automakers and away from Ford, General Motors (GM), and Chrysler (the Big Three), because foreign-headquartered firms tend to specialize in vehicles that are favored under the new standards. CAFE standards are costly, inefficient, and ineffective regulations. They severely limit consumers’ ability to make their own choices concerning safety, comfort, affordability, and efficiency. Originally based on the belief that consumers undervalued fuel economy, the standards have morphed into climate control mandates. Under any justification, regulation gives the desires of government regulators precedence over those of the Americans who actually pay for the cars. Since the regulators undervalue the well-being of American consumers, the policy outcomes are predictably harmful. With the Democrats taking control of the US House of Representatives, we we will likely see them attempting again to “fight climate change” by means of counterproductive regulations and rules. This post explains why such policies are ineffective, create unintended consequences that can make matters worse than doing nothing.